I love feeling clean and fresh after showing. But some people don’t understand that your skin has dead cells on it everyday. That’s why you ave to exfoliate at less once a week. When my skin feels fresh I feel like a whole new person. I was watching some video’s about weight loss and how dry brushing can help aid you in your weight loss journey. It’s recommended to brush every day and doing it will help blood flow to the areas you want to loss weight in. I like to share some Frequently Asked Questions (FAQ’s) to get the most out of your Body Brushing experience. Is it ok to brush every day? Yes! It is recommended that you do this as part of your regular beauty routine. Why do people recommend a brush with natural bristles? Natural Bristles are going to be more gently on your skin and the body usually responds better to natural things. Yes our bristles are 100% natural boar bristles. 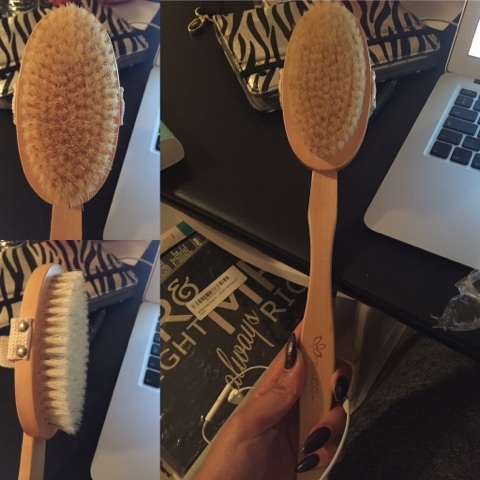 What are some of the benefits of dry brushing? There are many great benefits to dry brushing. Some of the most focused on ones are; smother healthier looking skin, Increased circulation, and cellulite reduction. Another great benefit to body brushing is just an overall body detox. Is dry brushing better or is it better to use the brush in the shower? Both will be good however it is recommended that you use it for dry brushing right before you shower. This will actually help eliminate more of your dry skin cells and then you can rinse them off in the shower. Dry brushing will actually have an all around better effect on your skin, however if you wan to use it as a scrubber in the shower that is great too. SPA QUALITY BODY BRUSH: Is made to provide you with that luxury feel every time you brush. 100% NATURAL BRISTLES: (a must) To ensure a truly organic brushing experience. These bristles are firm enough to feel yet gentle enough for your beautiful skin. DETOXIFY: As your bodies natural cleansing systems are activated through regular use. TERRACHERIÉ Guaranties you will be satisfied with your truly remarkable brush. Next COUPON CODES for Amazon!